It used to be that politics and sports were as separate from one another as church and state. The ballfield was an escape from the world’s worst problems, top athletes were treated like heroes, and cheering for the home team was as easy and innocent as hot dogs and beer. “No news on the sports page” was a governing principle in newsrooms. But as journalist Howard Bryant reveals, this has always been more complicated for black athletes, who from the start, were committing a political act simply by being on the field. In fact, among all black employees in twentieth-century America, perhaps no other group had more outsized influence and power than ballplayers. The immense social responsibilities that came with the role is part of the black athletic heritage. It is a heritage built by the influence of the superstardom and radical politics of Paul Robeson, Jackie Robinson, Muhammad Ali, Tommie Smith, and John Carlos through the 1960s; undermined by apolitical, corporate-friendly “transcenders of race,” O. J. Simpson, Michael Jordan, and Tiger Woods in the following decades; and reclaimed today by the likes of LeBron James, Colin Kaepernick, and Carmelo Anthony. The Heritage is the story of the rise, fall, and fervent return of the athlete-activist. 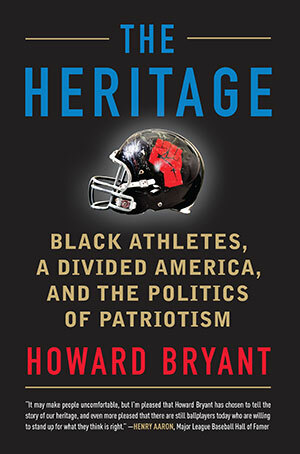 Through deep research and interviews with some of sports’ best-known stars—including Kaepernick, David Ortiz, Charles Barkley, and Chris Webber—as well as members of law enforcement and the military, Bryant details the collision of post-9/11 sports in America and the politically engaged post-Ferguson black athlete.